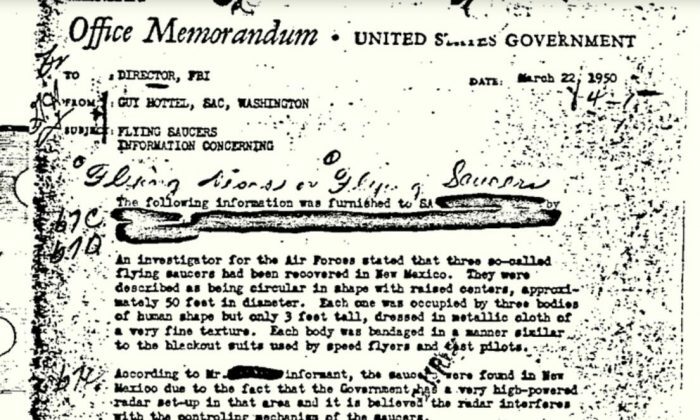 Declassified FBI Memo: Flying Saucers Found With 9 Aliens Inside? The FBI opened “The Vault“—a library of documents released to the public through the Freedom of Information Act—in 2011. In the following two years, a particular document now known as the “Hottel Memo” received nearly a million views. Each one was occupied by three bodies of human shape but only three feet tall. In 2013, the FBI made a public statement on the memo, since it had received widespread attention. After initial reports that a UFO crashed in Roswell, the military said it was a weather balloon that had crashed. Follow @TaraMacIsaac on Twitter, visit the Epoch Times Beyond Science page on Facebook, and subscribe to the Beyond Science newsletter to continue exploring ancient mysteries and the new frontiers of science!